They were not kidding about how hot these Texas summers can be. It's been a straight shot of 90 and above since June and it has gotten us craving sweet tea, lemonade and any kind of lemony dessert. 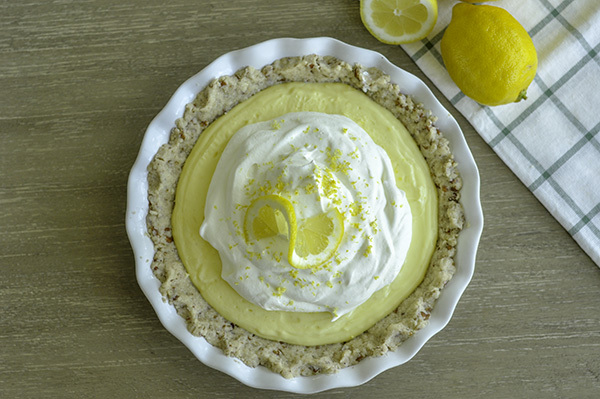 So when I came up with this Sour Cream Lemon Pecan Pie, it caused quite a stir in my house. The crust is made up of a toasted pecan shortbread, filled with a light and fluffy lemon cream and then topped with airy whipped cream. This pie was made for Texas summers. I have made this pie twice in one week because we were all fighting over who got the last slice. And since it's not a very difficult recipe, I figured the more the merrier and made it again! I'm expecting it to go just as fast as the first batch did so be prepared for a bit of a dessert battle of you decide to make this!